Joe Houlihan started his Real Estate career in 1984 as an appraiser, running Houlihan & O’Malley’s ‘Residential’ appraisal division. He interacted with Realtors on a regular basis and felt a natural attraction to real estate sales. In 1998, Joe founded the Residential Sales Group at Houlihan & O’Malley with the dream of creating a boutique real estate office in Bronxville. His goal was to provide true personal service and know-how, a real departure from the large, institutional corporate entities that are ubiquitous in today’s real estate industry. To Joe, real estate is personal; it’s all about relationships and personal service. Clients are treated like valued members of his family. At Houlihan & O’Malley, clients receive an exceptional level of personal service from real estate agents who are knowledgeable, responsible, detail-oriented, and dedicated. We anticipate your needs, and respect your time. Excellence is our motto. Joe comes from a long line of Realtors©. He can track his family’s involvement in real estate back to his great-grandparents, Daniel and Margaret Houlihan, immigrants from Ireland, who began buying and selling building lots in Manhattan and the Bronx in 1891. Joe runs the residential real estate side of his business, while his brother and partner Dan handles the commercial property group. Joe’s sister, Liz Genovese (there are nine siblings), is in charge of commercial appraisals. His brother, Gerry, a former restaurateur, specializes in restaurant consulting and brokerage. And if that were not enough, one of Joe’s most seasoned agents, Pat Houlihan, is the wife of his cousin Jim Houlihan, who runs Houlihan Parnes, a real estate investment and service company headquartered in White Plains. Houlihan & O’Malley agents have received numerous awards from the Hudson Gateway Association of Realtors (formerly the Westchester Putnam Association of Realtors) for outstanding performance. All Houlihan & O’Malley salespersons are members of the Hudson Gateway Association of Realtors, the New York State Association of Realtors, and the National Association of Realtors. We also believe in giving back, and support many worthwhile community organizations and charities. 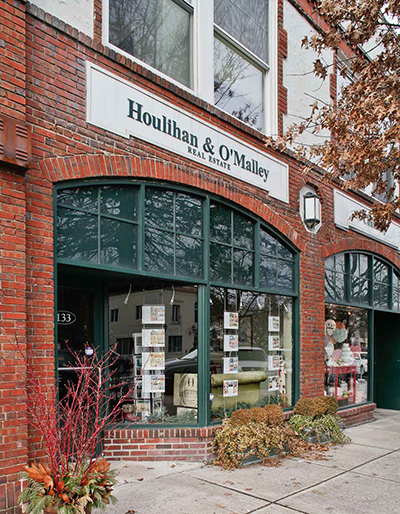 Based in Bronxville, Houlihan & O’Malley Real Estate was founded as a boutique real estate agency to provide you, the client, with the highest level of personal service you expect and deserve. Our Residential Sales Group helps you buy or sell property throughout Westchester. However, Houlihan & O’Malley can help you with almost any real estate transaction – whether residential, commercial, new construction, or finding undeveloped land. In short, our agents will provide you with comprehensive, high-quality buyers’ and sellers’ service. So when you decide to buy or sell a home, or if you hear that any of your family and friends are looking to buy or sell, be sure to take advantage of the knowledge, experience and professionalism that we offer at Houlihan & O’Malley. It will be our privilege to be your Realtor®.